And so, for the next instalment of the Mayor's Indian Adventure. Day 4: Ken takes the train. Perhaps he had business on his mind or perhaps he was marvelling at Mumbai's suburban railway system built and operated by the British in the days of the Raj. 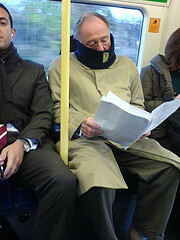 Or perhaps he was thinking, if only London Overground was this reliable. Image of public transport loving Ken courtesy of montini's Flickrstream.